In the autumn of the largest smartphone builder is preparing to release a new flagship model, which should ensure a successful New Year sale. On most of the functions iPhone 6s and iPhone 6s Plus is known only from rumors and leaks of information from the companies. Greenpois0n selected six of the most interesting features of the new smartphone Apple, which should appear in September. Force Touch technology in the new iPhone can recognize the force pressing on the display. Thus, the display will become more sensitive and allows users to interact with the gadget a large number of gestures. For example, in the music player, you can press the power will control the speed rewind the track: the more touching, the higher the speed of the rewind and so on. The technology is already integrated in the smart watch Apple Watch and new models of laptops MacBook. The fact that the Force Touch appears in a new iPhone, the media first heard in April. As for the photo and video, iPhone 6s and iPhone 6s Plus should be required to improve this area, because now it is one of the most important, since smartphones systematically replacing the usual cameras. Resolution main camera, starting with the iPhone 4s sample of 2011 remained the same - 8 megapixels. In other words, Apple has focused not on the count of megapixels, and high-quality optics, large pixel size, powerful sensors, powerful filter, advanced image processing algorithms. However, the time has come for change: in the iPhone 6s and iPhone 6s Plus resolution rear camera rises to 12 megapixels. It is possible the camera lens extending beyond the body, cease to be such, thus emphasizing the solidity and integrity of the design. Although unlikely to do so, given the subtlety of housing version of the smartphone. For calculating the iPhone 6s and iPhone 6s Plus will meet next-generation processor Apple A9, assembled in factories Samsung Within 14 nm technology standards. Manage iPhone 6 and iPhone 6 Plus given 20 nm chipset A8 assembly lines TSMC. Miniaturization allows computing crystal as well as to increase productivity and reduce energy consumption. According to reports, Apple will equip iPhone 6s RAM to 2GB, made standard LPDDR4. This will provide increased performance relative to the previous generation, optimizes games and applications pre-installed browser Safari. 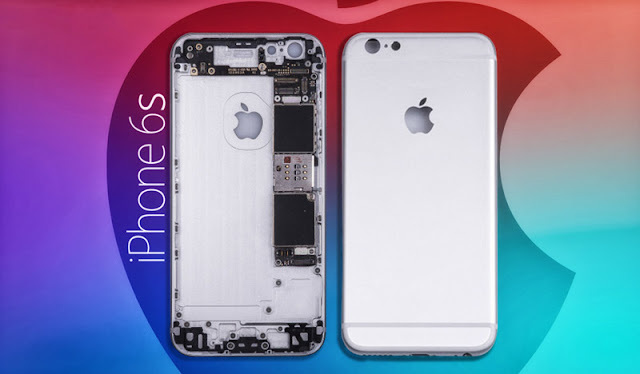 The exterior of iPhone 6s and iPhone 6s Plus will remain without any changes, but the material body will change. The new models will be invited vestments series aluminum alloy 7000. This material is a combination of aluminum and zinc, is already used as part of a smart Watch line Sport. Seeking th 7000 alloy used in racing bikes, it is 60% stronger than other aluminum composites, although one-third less durable compared to stainless steel, but it is much easier. For reference: Galaxy S6, as well as the Galaxy S6 edge, stopped for aluminum alloy 6013, despite the fact that most other smartphones, including the iPhone 6 and iPhone 6 Plus, refer to the 6063-th, which is one and a half times less durable and less than 1.2 times resistant to scratching. The most resilient to the adverse effects of a 7075 aluminum alloy. Due to the screen, the touch sensitivity, iPhone case will be thicker than about 0.2 mm, and add to the height and width of 0.15 mm. However, users are unlikely to notice it - the thickness of the iPhone 6 is 6.9 mm, the iPhone 6 Plus - 7,1 mm - but the usable space inside the body will be filled with more capacious battery. Due to a more energy-efficient hardware and software improvements in iOS 9 new generation of Apple-smartphone promises a long work offline.